Polyunsaturated fatty acids are liquid oils. They increase the good cholesterol, HDL, which protects the heart. Other good fats are Omega 6 and Omega 3. Omega 6 is present in fish oil and is called linoleic acid, while Omega 3, called linolenic fatty acid, is present in primrose oil. Monounsaturated fatty acids are liquid at room temperature, but solidify when chilled. We can reduce the risk of heart problems if we replace saturated fats with monounsaturated fats as the latter reduce LDL and increase HDL. They also appear to reduce free-radical damage (associated with ageing), some types of cancers, heart disease and rheumatoid arthritis. Good sources include olive oil, rapeseed oil, nut oils like groundnut and hazelnut oils, nuts, seeds and avocados. Omega 3 fatty acids are polyunsaturated fatty acids and include linolenic derivatives. These reduce the risk of blood clotting and hence, heart attacks and strokes. They also help against inflammatory diseases. Good sources are oily fish like mackerel, salmon and sardines; dark green leafy vegetables like spinach and kale; and walnuts, linseeds, pumpkin seeds and soybeans. Vary your diet: Your diet should consist of 50-60% complex carbohydrates, 25% fruits and vegetables, 15% proteins, 10% good fats. Say no to fad diets: Fad diets that eliminate fat or protein or carbohydrates almost always make the weight come back once you go back to regular eating. This weight yo-yo puts your heart at risk. Get the formula right: If a man weighing 85 kilos wants to lose 12-13 kilos, his daily caloric intake needs to be around 2,000 at 50-60% carbohydrates 25% fruits & vegetables, 15% proteins and 10% good fats. Plus, he needs to do 30-40 minutes of aerobic exercise (cycling or swimming) four to five times a week. Keep your BMR high: A diet that includes smaller quantities of a large variety of foods will ensure nutrition and a high Basal Metabolic Rate (the rate at which the body burns calories). Cut the calories: Reducing calories and increasing exercise, not just fat, will help you lose weight. Protect your heart: If you are over 35, good fats will protect your heart while you lose weight. Amita Katkar, 37, started working as an insurance sales advisor 10 years ago, when her employer began to recruit housewives. What started out as a trial has now become a successful occupation. Over the years, she has grown to become a top performer and won many reward trips to London and Hong Kong. In between, she also delivered two children. Everything seems to suggest that she has perfect control over her life and career. But one worry continues to nag Amita: her weight-she gained 42 kilos in a decade. Her petite 52 kg frame has gone up to 94 kg. A closer scrutiny of her diet reveals that she has been cutting down on fat and eating low-fat foods. She started going on walks, too. She began these efforts to burn the fat seven years ago, but continued ballooning. So, why is Amita unable to lose weight? And why are her cholesterol and triglyceride (a type of fat) reports out of whack? The answer is simple and surprising: she has eliminated the good fats that help keep one healthy. We all know the answer, but we don't really try to make them a part of our diet. It is essential that we consume good fats (See: The Good Fats), and that 10-15% of our total calorie intake comes from them. Good fats are necessary for absorption of fat-soluble vitamins like A, D & E. They help transport these vitamins to various parts of the body. They also help make vitamin A from beta carotene, a type of pigment found in plants, especially in carrots and colourful vegetables. Good fats are found in oily fish, olive, mustard, flax seeds, nuts and seeds. They protect the heart by raising the level of high-density lipoprotein (HDL), the good cholesterol. They keep the brain calm and less jittery. 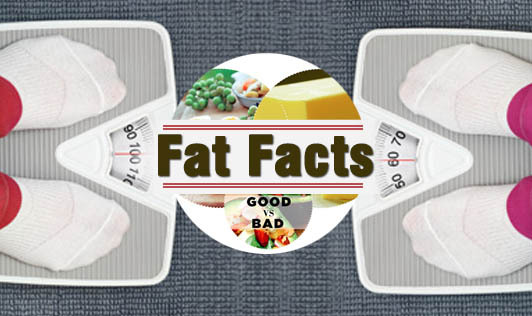 A diet low in good fats can make you extremely unhealthy, physically and mentally. Good saturated fat has many other benefits as well. For example, a little bit of butter with a low-calorie meal (350-400 calories) actually never gets deposited in the blood, but is used as energy since it consists of short and medium-length fatty acids. In children, until age nine, saturated fat actually provides the foundation for higher brain development, after which it starts getting converted into fat. That is why most girls start putting on weight at 10. They need the saturated fat till nine, and unsaturated fat after that. The point to remember? All fats have high energy content, and if you don't burn what you ingest, your weight will increase, as will your risk of developing diseases in the long run. Refined carbohydrates, sugar, sugar substitutes, diet drinks and diet namkeens that don't list the hydrogenated fat they're made in are the culprits in Katkar's case. They posed a far more serious threat to her health than fat. And the good fat that is protective in nature is absent from her body. The artificial sweeteners and refined namkeens are playing havoc with her internal chemical balance, leading to bloating, forgetfulness and joint pains. Refined carbohydrate diets have a high glycemic index (GI), and increase the levels of blood glucose and of harmful blood fats known as triglycerides. Such diets also reduce HDL levels, thereby increasing heart-disease risk, according to a recent report in the Archives of Internal Medicine. Choosing low GI carbs­-the ones that produce only small fluctuations in our blood glucose and insulin levels-is the secret to long-term health. It reduces the chances of heart disease and diabetes and is the key to sustainable weight loss. Oats, barley, whole wheat, apples and watermelons, among others, have a low GI. Foods with a high GI include white breads, noodles and white rice, among others. A Shanghai Women's Health Study recently concluded that women whose diets had a high GI were 21% more likely to develop type 2 diabetes than women whose diets had low GI. Similar findings were reported in a study on African women. A diet programme that manages the glycemic levels aims to avoid sustained blood sugar spikes, and can help avoid onset of type 2 diabetes. For people seeking weight loss, low GI foods will help burn calories faster. On the other hand, diets with low good fat, though they burn calories, will put your heart at risk and make you look old. So, what would you rather do? Look slim and youthful, right?